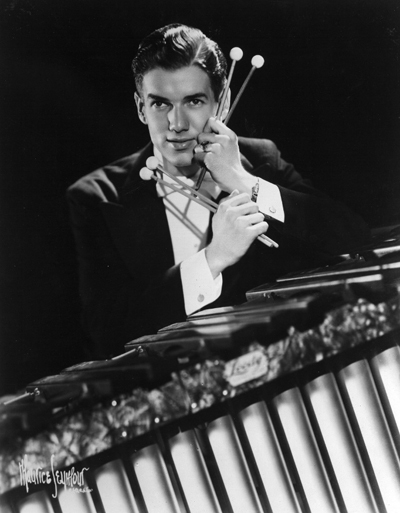 Val Eddy (May 11, 1912 – November 24, 2006), born Chester William Smith, was a highly successful xylophonist, drummer, composer, arranger, author, and real estate broker. During World War II he attended the Navy School of Music and served on the battleship USS California, where he became an arranger for the ship’s band. At the conclusion of the war, Eddy finished his six-year enlistment as a member of the U.S. Naval Academy Band at Annapolis, Maryland. During his professional career he appeared with such performers as Danny Thomas, George Gobel, Sarah Vaughn, and Lucille Ball. He also made radio and television appearances on Arthur Godfrey Talent Scouts, Live Like a Millionaire, The Mollie Goldberg Show, and Horace Heidt’s Hit Parade. 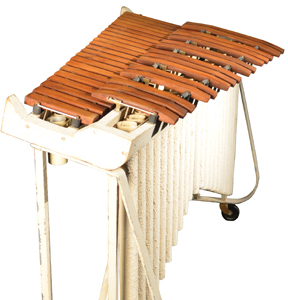 As an endorser for the Leedy DrumA hollow cylindrical shell of any size that has a head stretched over one or both ends and is b... Company, Eddy used three different xylophones during his career, all of them modified with the keyboard angled forward so that the audience could better see him strike the bars. While his 4-octave and 5-octave instruments were utilized for live and recorded performances, his custom-built, 3-octave instrument was used as a practice instrument, often traveling with him in a trailer behind his car. 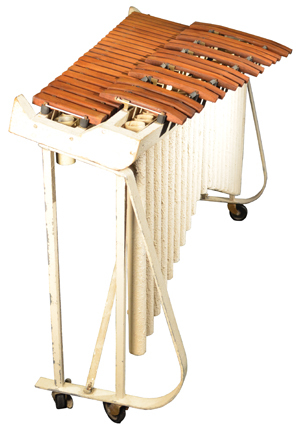 This 37-bar instrument has a chromatic range from C4 to C7, with bars measuring from 13.5 x 1.5 inches (C4) to 6.5 x 1.5 inches (C7). The sloping accidental bars are .75 inch at the nodes and taper to .5 inch at both ends. 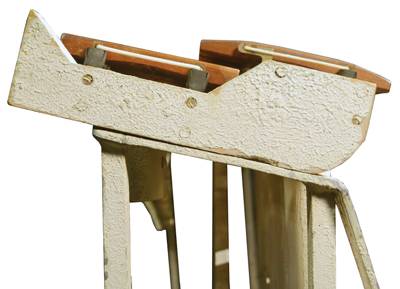 The large end of the frame begins at a height of 29.5 inches and rises to 35 inches. The frame is 55 inches in length and measures 23.5 inches at its widest portion.